Affiliate Marketing For Bloggers ebook ~ The ebook for every blogger! 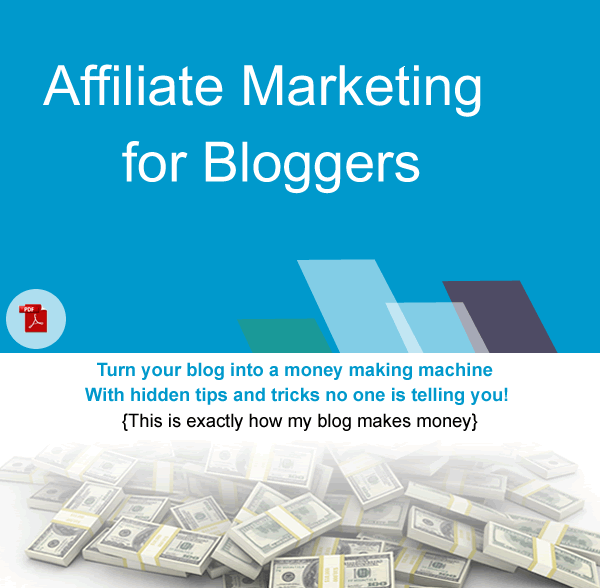 →Affiliate Marketing For Bloggers ebook ~ The ebook for every blogger! Affiliate Marketing is one of the most exciting ways to make money as bloggers. I’m excited about how my blog generates income through this money making model. That’s why I wrote the book Affiliate Marketing For Bloggers. In this ebook, I shared the methods that work for me, mainly on this blog. I also pointed out some other successful blogs and showed you how they make their money. Some of the points I brought up about other blogs in these books are so exciting. It will be interesting to see how these bloggers do certain things on their blogs that keep generating their income. Note that they will never tell you this is how they make their money. Affiliate Marketing For Bloggers ~ The ebook for every blogger! Content: Focused on how bloggers can properly monetize their blogs with affiliate marketing, showing practical examples. Who should read it: All bloggers who want to make money with their blogs. The methods shared, if implemented will generate results no matter your niche. I want to make sure you grab your own copy of this book because I know what’s inside. So I have generated a discount code for my readers – the first to take action. The affiliate program is hosted by DealGuardian. It has exciting features including unlimited coupons, tagged coupons, unlimited landing pages (this allows me to create co-branded pages), excellent support, etc. One of the ways to boost conversion is to get a co-branded sales page. Your affiliate link will redirect your traffic to your branded page and this will be exceptional marketing strategy. In addition to your branded page, I will create a unique discount code for your promotion. Your readers will appreciate this and conversion will be great. Once you have your copy, you’ll learn some exceptional techniques to promote it and make more money. Great ebook with tons of helpful and useful info. I ordered a review copy but would love to go through thoroughly once again after you sent an updated version. This is a must have for every blogger aiming to create more income streams in 2016. Looking forward to begin promotion as soon as I forward the required details to getting a co-branded sales page. Please get back to me with your material when ready. Hi Enstine, This is an amazing post and I always find something interesting here. Best thing about yours posts are that they are detailed and up to the point. This sounds like an excellent product Enstine! let us have a peek behind the affiliate marketing curtain!LOL! definitely worth way more than what you’re asking for it!LOL! Mark recently posted…Why Some Extremely Savvy Entrepreneurs Rely On This Particular Secret Weapon More Than Others! Well congratulations on creating this fabulous product and I know it will be a huge success. You are one of those who are walking the talk so who doesn’t want to learn from people like that right! I’m eager to check out your eBook and share my own thoughts about what I’ve learned. I know you’ll do really well with it and I can’t wait to dive in. I want to wish you the very best and I know this year will be another amazing one for you as well. Happy New Year my friend. Good to see you here. I know you are very catching up with a lot of work, including dealing with your new design and comments on the latest post. So thanks for making up time to drop a comment here. I’ll be excited to hear what your thoughts are about the content. Even after the discount it’s quite a bit pricey. At $12, in India you could buy a hardbound 1000 page book printed on high quality magazine paper, almost on any subject. As this book contains your proven methods of affiliate marketing, perhaps it deserves that price. Good to see you here and thanks for your feedback. However, what’s important is the content not the length. You can buy a book of 300 pages that tells you all the story about Affiliate Marketing. That may not help. On the other hand, a book of 50 pages that gives you actionable points and examples is worth more. what we want is result and that’s what you get from my book. Yes, i agree with you bro! You may find book with a lot of pages but it may not add more value to you! Just you need to analysis the quality of book. And, there is no worth to buy book about which you know about it before! Anyway, happy to see you after long time bro! It was not a negative comment at all !! I was just expressing my thoughts. Hope I’ll have one copy too in near future. Btw, I’m a regular visitor of your blog. Enstine this is an amazing book. I’m new online and my blog is on the way. I decided one of the ways to make money is to paste banners on my blog for Affiliate Marketing. I have bought a couple of books including one written by Harsh of Shoutmeloud. When I read about yours, I didn’t want to buy initially because I thought to myself Harsh’s book must have covered it all. But when I read that you shared your personal experience, I decided to give it a try with the mind to ask for 100% refund if I don’t see anything new. I was absolutely wrong buddy. It’s absolutely crazy those things you shared in this book. When I read page 40, I found something that I’m sure will not be found somewhere. It’s a smart method Harsh is using and you clearly reveal it. He didn’t even say it in his own book 😉 Not a problem though. I read online about writing review posts to generate sales but you added some very vital points. I didn’t know about the coupon thing you explain. I never thought about the smart way to recommended to collaborate with affiliate managers. I used to think those bloggers that publish their earnings do that just to show off. I never could imagine those reports generate more money for them. Crazy! I wanted to go with Aweber to create a list for my blog but since you mentioned you are using ininbox, I will give that a try. I was also excited to read how you made 7 sales in 24 hours with a post combined with your list. A lot of points in your book and I highly recommend it. I’m glad I got a copy. Congratulations man. I bought your e-book from the link you send in the e-mail . Thanks for the your valuable contents in it. Also, I would like to join your affiliate program that I will do from the link in this post. Nice Post .. You are doing great here. Seriously bookmarked your site ..! Awesome Post + Awesome Blog = Huge Money! I was very interested in your post and your ebook offer as I truly think I could benefit from your knowledge of affiliate marketing as a blogger. So sadly I could not complete my transaction – I must tell you that one one previous occasion I had a similar problem with Deal Guardian when trying to purchase something – never had this experience with any other online merchant. I would have been very interested in your affiliate program and the co-branding option but I did not pursie it once DealGuardian stopped my initial purchase. Is there some other way I can access your ebook? Peter Beckenham recently posted…Are You Engaged Yet? This is sad and I’ll get it across to those tech guys this moment. I have however been getting orders but I’m thinking this is happening to other buyers and it’s getting me worried. Could you please give it another try while I forward to them this issue? So please do clear your cookies and let’s see how it goes. I will try again but not sure about the “affiliate being suspended” as the link I used was from your latest blog post. This money making book seems quite exciting. I would suggest this to my known bloggers. It’s good to see that the book allows to make money regardless of niche. Hello Admin, I have no idea about Affiliate Marketing. If I want to buy this E-Book after that you will update E-Book for affiliate marketing so I will pay another payment or First Time Payment For Lifetime update guarantee, please tell me now about it. Asif recently posted…How to Run an Adwords Campaign Tutorial in Urdu. Yes sure you’ll get free updates which will be released any time. This looks to be the best affiliate marketing eBook, hopefully will help many bloggers to generate more affiliate sales. Enstine Muki your posts are always helping and informative thanks ! A motive that affiliate marketing is so well-known is on the basis that it is so simple to do. Regardless of the fact that marketing and assigning individuals to your offers may necessitate a smidgen extra exertion and know how, building an affiliate site that will display the items that you want to offer is quite straightforward to do. I will definitely have to get a copy of your ebook. I’m very sure you have a lot of helpful tips in it that not only I can use but also my email list can use for themselves. Thanks for sharing Enstine and Happy New Year! Thanks so much for your book and explaining how to monetize our blogs. I have the book and I am looking forward to working with the suggestions you made with my own blog. Keep all of your awesome ideas coming. I have personally read your book and it is fantabulous! I will sign up as affiliate now and follow tips you mentioned in your Book! I personally love to read books that are about affiliate marketing. From every book you learn something new. Looking forward to read this one. I love to read books that are about affiliate marketing or email marketing. From every book you learn something new and it can help you in your business. Thanks so much for your book and explaining how to monetize our blogs. I want to purchase the book and I am looking forward to working with the suggestions you made with my own blog. Keep all of your awesome ideas coming. This Affiliate Marketing Tactic won't fail you. Trust Me, the 3-P method Works!